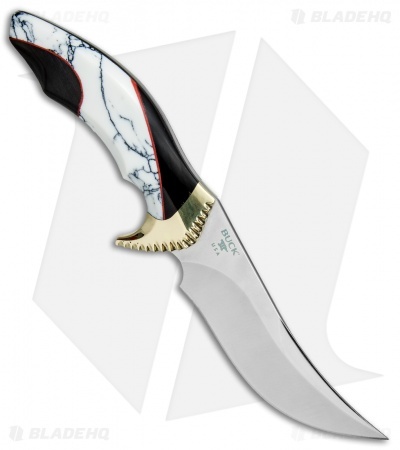 This Buck Kalinga Legacy model is built with an elegant white turquoise and buffalo horn handle with a brass guard. 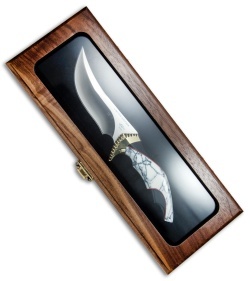 It is limited to just 100 pieces worldwide and includes an impressive walnut presentation box. The Buck Kalinga fixed blade offers a classic Buck design that has been revamped with modern materials and a high performance design. 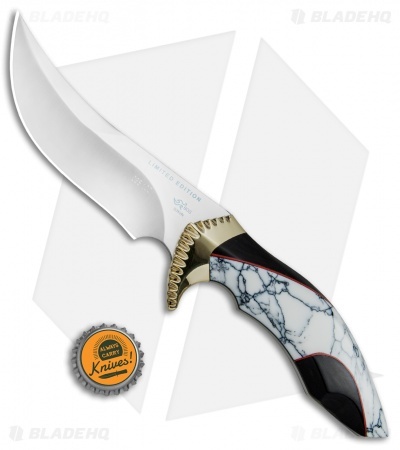 The original Kalinga was Al Buck's personal favorite sportsman's knife and this updated model encompasses all the exceptional qualities that made this an instant classic. This Legacy model features a large sweeping skinner blade made from CPM-S35VN steel. The contoured handle offers a secure grip with a brass guard and smooth finger grooves. Manage any difficult outdoor cutting chore with the Buck Kalinga fixed blade. It could take an hour to state everything this knife is in real life, outside of any photo. 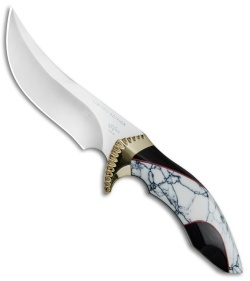 The entire knife is just pure beauty, exquisite in design. The brass guard depicted in the photo looks bland, compared to real life. The brass shines like it is gold, and the jimping on the guard is perfectly cut and polished to a brilliant gleam. The turquoise/buffalo horn handle is something to see and feel. The fit is perfect, for me anyway, and I have large hands. Again, photos don't do it justice. I'm so pleased with taking the chance on getting this knife. It's a piece that will be in my collection for a long time. If you are a serious collector of Buck knives, then don't pass this one up. It's well worth the money. And, with only 100 being made worldwide, it can only go up in value. That should be motivation enough to grab this while you can. BladeHQ did a GREAT job in the order confirmation, shipping, and packaging...as always. With the tracking # provided, it's very easy to see when your item will arrive. Thanks, BladeHQ for another GREAT transaction. And a big Thank You to Casey in Customer Service who took the time to confirm the shipping of this item. I truly appreciated it.